Hydrocodone is a narcotic opiate pain reliever used to treat moderate to severe pain, according to the National Institutes of Health and Drugs.com. One of the side effects is a loss of appetite. Hydrocodone is usually prescribed in tablet from in doses of 5 mg or 10 mg in combination with 325 mg or 500 mg of acetaminophen. San Diego State reports that the U.S. Drug Enforcement Administration, DEA, classifies hydrocodone as a class II controlled substance. You should only use hydrocodone as prescribed. 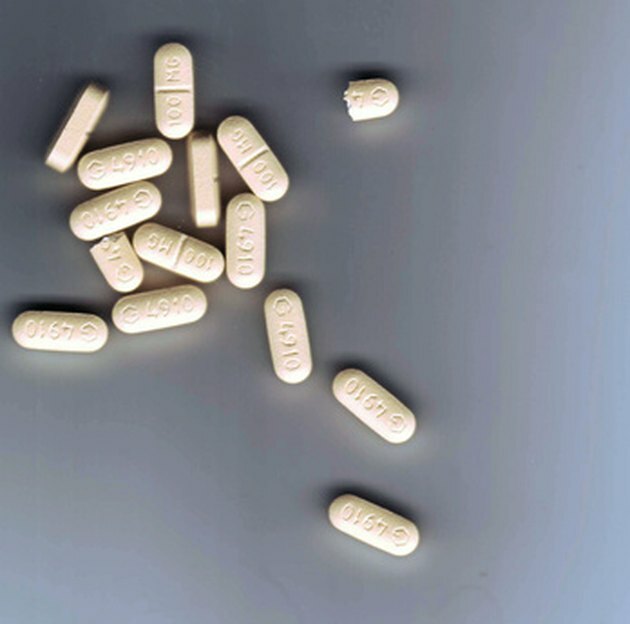 One of the most common side effects of taking hydrocodone is a noticeable loss in appetite, according to Net Wellness, a service of the University of Cincinnati. Net Wellness states that you could reasonably expect the loss in appetite to make you lose weight. This is especially true if you use hydrocodone for several months following a serious injury. All About Drugs, a national addiction rehabilitation service, notes that opiates such as hydrocodone block the pain center in your body, which diminishes the sensation of feeling hunger and may cause you to eat less food. Simply eating 500 less calories a day for a week will make you lose one pound a week, according to Columbia University. Appetite suppression, like the majority of hydrocodone's side effects, is dose dependent. In theory, the more hydrocodone you consume, the less appetite you will have if you are prone to this side effect. Hydrocodone can cause digestion problems that may discourage you from eating. The Johns Hopkins School of Medicine and Drugs.com report that opiates such as hydrocodone can cause constipation because they suppress you central nervous system. The potential side effect of constipation often discourages patients from eating solid food or calorie dense foods while using hydrocodone. This is often why doctors recommend taking laxatives with hydrocodone. Net Wellness reports that hydrocodone can also cause an upset stomach, which can also discourage you from following your regular solid food diet. Simply eating fewer calories will make you lose weight. Once you discontinue the medication, your digestion should return to normal. According to the Institute for Substance Abuse Treatment Evalutation and Drugs.com, hydrocodone can make you feel drowsy and very tired. This is why it is suggested that you do not drive after taking hydrocodone. Drowsiness and sleepiness can be intensified if you are a first-time user or do not have any tolerance for opiates. If you are taking hydrocodone multiple times a day for pain relief, the drowsiness may cause you to miss meals or simply feel less motivated to eat. Hydrocodone is not meant to be used for weight loss. Weight loss is a side effect of this medication. Once you discontinue the medication, your normal appetite should return and the other side effects should cease. If you remain on hydrocodone for a prolonged period, especially at high doses, you may experience withdrawal from this potent narcotic. Hydrocodone and all opiates have an extremely high potential for addiction because of the euphoric psychological feelings they produce and their ability to eliminate pain. Please talk to your doctor about your fitness goals. Do not hesitate to seek treatment if you are unable to stop taking hydrocodone.